"Victor Lewis is a master of shading and color, and the kind of timekeeper that could teach a clock new ways to tick." Internationally acclaimed drummer and composer Victor Lewis was born on May 20, 1950 in Omaha, Nebraska. Lewis started studying music when he was ten and a half years old. He began on the cello because he was too small for the acoustic bass, but switched to the drums a year and a half later after watching the local drum corps marching on the Fourth of July and other holidays. He also studied classical piano which is when he learned how to read music. Lewis began playing drums professionally on the local scene at the age of 15. Because few of the older drummers in Omaha could read music, the young percussionist was called up for a variety of commercial jobs, including jingles, the Bob Hope Show, even the circus. At first Lewis�s style reflected his attraction to the big band drummers he had seen with his father and heard on records, but after hearing a record of Miles Davis's Quintet with Tony Williams things changed. He began exploring Williams' sound and the styles of other great small group drummers like Art Blakey, Kenny Clarke, Max Roach and Philly Joe Jones. Soon afterwards he started his own small group to play around town. His first job with a nationally known jazz musician was accompanying Hank Crawford in Omaha. After he graduated from high school Lewis enrolled in the University of Nebraska as a music major. There he studied classical percussion because the school had no jazz program. In his senior year, he attended a Herbie Hancock concert and got to hang out with the band which included Buster Williams and Billy Hart. Excited by the experience and encouragement, he left Nebraska to go to Minneapolis with a cabaret show to earn enough money to move to New York. A year later, on September 16, 1974, he arrived in the jazz capital of the world with $200, a suitcase and his drums. On Lewis�s first gig in Manhattan, a night at Boomer�s with bassist Buster Williams' group, he met trumpeter Woody Shaw. Lewis joined the trumpeter�s band and a few months later, he made his recording debut on Shaw�s classic, The Moontrane. Lewis was soon busy performing with Shaw all over the U.S. and the world. He remained with the trumpeter for the next several years, developing his talents as a jazz drummer. On his one brief hiatus from Shaw's group, he toured with tenor great Dexter Gordon and recorded on his landmark Sophisticated Giant album. The drummer also began making his mark on the burgeoning fusion and pop jazz scenes, providing the beat on records by Joe Farrell, Earl Klugh, Hubert Laws, Carla Bley and David Sanborn. It was on Sanborn's lps that Lewis's compositional skills were first exposed to the public. In 1980, Lewis left Shaw�s group to join another tenor giant, Stan Getz, beginning an association that would last up until the saxophonist�s death in 1991. By the end of the eighties, Lewis was one of jazz�s busiest freelancers. He toured and recorded with a wide array of the music�s most respected leaders. The long list of artists including Johnny Griffin, Art Farmer, J.J. Johnson, Mike Stern, John Stubblefield, Grover Washington Jr., The Manhattan Jazz Quintet, Bobby Hutcherson and Bobby Watson attest to his talent and versatility. Lewis has also been the main-stay in the Kenny Barron Quintet since its inception. Among the many tunes he has contributed to this band, his much heralded "Big Girls" can be heard on the pianist�s Quickstep disc on Enja, "Hey, It�s Me You�re Talkin� To" on the Polygram release Other Places. Still one of the busiest performers around, Lewis is also currently composing music for several upcoming recording projects, including his own efforts, and continuing his attempts at combining lyrics with his tunes. He made his big-screen performance debut in the film Kansas City from producer/director Robert Altman. A fictionalized account of jazz and the scene in the music capital in the early 1930�s, the film stars Harry Bellafonte and Jennifer Jason Leigh. 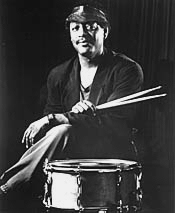 Lewis portrays a character loosely based on the drummer and jazz-legend Papa Jo Jones. In 2003 Victor Lewis joined the faculty of Rutgers University in New Brunswick, NJ where he teaches drummers and coaches jazz combos. A selected discography of Victor Lewis albums. Know It Today, Know It Tomorrow, 1992, Red. Three Way Conversations, 1998, Red.